Heading into Thursday trading, global stocks were set for another downbeat session when China's Ministry of Commerce broke news broke that - at the invitation of the US - China would send its Vice Commerce Minister, Wang Shouwen, to the U.S. for low-level trade talks in late August, the first official exchanges since earlier negotiations broke down two months ago. The Chinese delegation would meet with an American group led by David Malpass, under secretary for international affairs at the Treasury. 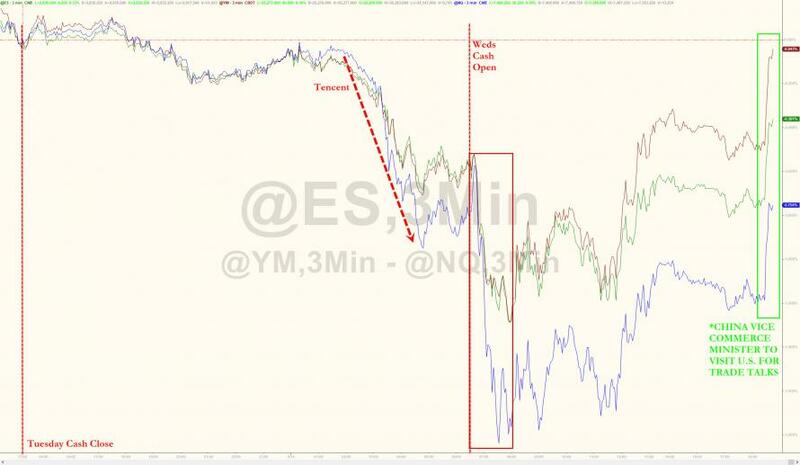 The news - which the market immediately interpreted as an opportunity for an end in the trade war between the US and China - sparked a furious risk-on rally, which sent US futures, the offshore Yuan, and other risk assets surging, while the dollar and Treasuries slumped. Maybe the market got ahead of itself again because the upcoming talks will be at a relatively low level: "This will be ‘talks about trade talks,’” said Gai Xinzhe, an analyst at the Bank of China’s Institute of International Finance in Beijing. “Lower-level officials will meet and haggle and see if there is a possibility for higher-level talks." Yet for some reason, despite several rounds of failed talks to date, the market reaction clearly shows that investors are hopeful for successful negotiations. And while Asian stocks had to catch up to US selling of tech stocks in the aftermath of the Tencent earnings debacle, both Europe (with the exception of Italy, whose stocks slumped after Atlantia shares crashed the most since 1987 following the Genoa bridge tragedy) and US futures have held on to gains and the result is yet another (mostly) sea of green this morning as yesterday's drop has been faded. Still, as Gai Xinzhe, a Bank of China’s analyst noted, "Even if the senior officials reach a deal, things could still change, as President Trump can easily flip-flop. We have been there", he said quoted by Bloomberg. Others agreed: “The news (of the China-U.S. trade talks) triggered short-covering but I think fundamentally it is of limited significance,” said Yasuo Sakuma, chief investment officer at Libra Investments. One thing that could make China more amenable is that Beijing is - for now - a loser in the currency war. China’s equity market has suffered declines and the yuan has been on a losing streak for more than a month. Chinese authorities, bracing for economic fallout, have introduced measures to support growth ranging from shifting toward a more accommodative monetary policy to boosting fiscal spending. Which however begs the question why the US would invite China, especially if Trump is winning, if only for the time being. ... not only on the upcoming trade talks between China and the U.S. and stronger-than-expected fixing, but also a surge in the 12 month forward points, the latest attempt by China to force buy the Yuan, as currency bears were violently squeezed as the cost to short surged the most since 2016 (more on that shortly). 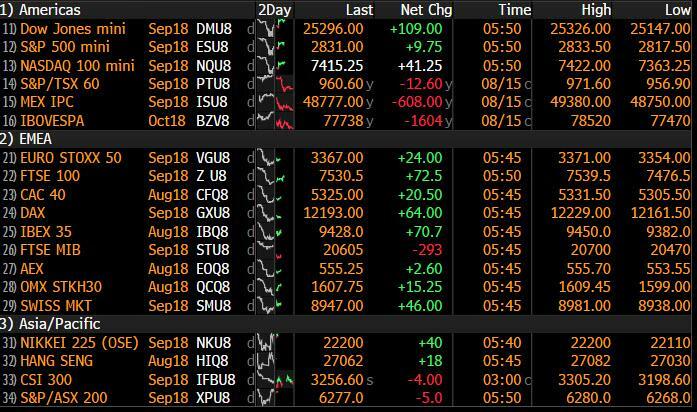 And as US equity futures and the Yuan rebounded on fresh hopes of easing trade tensions, so did European stocks while the dollar fell for the first time in 6 days and Treasuries dipped. After dipping into a bear market yesterday, the Stoxx Europe 600 Index rose, with most sectors in the green, however there was one outlier: Italian stocks declined as infrastructure company Atlantia SpA’s shares fell by almost one-fifth in the wake of a deadly bridge collapse. UK Retail Sales for July smashed expectations, rising 0.7% vs. Exp. 0.2%. ONS said that clothing sales possibly boosted by extended discounting, world cup and sunshine supported food sales. Earlier, Asian equities had hit one-year lows overnight as they tracked Wednesday’s global falls and Tencent results disappointed, though pared declines after the Chinese news of possible de-escalation in the trade war. Chinese stocks pare losses, with both Shanghai Composite Index and Hong Kong's Hang Seng index each down 0.8%. Earlier in the day, Shanghai was down as much as 1.9 percent while Hong Kong was off 1.7 percent. Japan's Nikkei average closed 0.1% lower in choppy trade, with the benchmark falling as much as 1.5% before a brief swing into positive territory on China news. Meanwhile, the crash across Emerging Markets halted, as EM currencies fought to regain their footing on Thursday, while the story of earlier this week, the Turkish Lira collapse, seeming ever more like a distant memory as the Turkish currency rose again, the USDTRY sliding from 6.00 to below 5.80, an increase in the value of the Lira of over 16% since Monday, its best three-day run since 1994. A drop in the dollar and the sight of the lira striding back above 6 per dollar, coupled with a sharply higher Chinese yuan also steadied emerging market currencies like South Africa's rand, Russia's ruble and Mexico's peso. And while EM stocks nudged lower again though after they entered a bear market on Wednesday, metals markets clawed higher, however, after copper had also entered ‘bear’ territory. Summarizing the latest state of global chaos, SocGen's FX strategist Kit Juckes said "the Chinese are heading to Washington and yuan bounced, the Qataris are heading to Ankara and the lira bounced and has left everything else floating around really." He added that it was still too early to sound the all clear around Turkey - its new finance minister and son-in-law of President Tayyip Erdogan will hold a global conference call later - and that the broader worries were still around the extent of China’s economic slowdown. Meanwhile, markets were still shaken by the weak earnings from Tencent: the Chinese tech giant which holds a 40 percent stake in the U.S. firm that makes cult game Fortnite reported its first quarterly profit fall in nearly 13 years on weak gaming revenue. That knocked other Asian tech firms with South Korea’s Samsung Electronics, Asia’s third largest firm by market cap, down to a one-year low, although the trade news quickly llifted market sentiment. The tentative recovery in risk appetite also saw bond benchmark German Bund and U.S. Treasury yields, which move inverse to the bond’s price, nudge up. In FX, the Bloomberg Dollar Spot Index slips from the highest level in more than a year as some dollar bulls take profits following confirmation that the U.S. and China would resume trade talks. Broad improvement in risk sentiment also weighed on the greenback as Treasuries slipped and European stocks edged higher. The Turkish lira headed for its best three-day run since 1994 while the pound advanced, snapping a two-day decline, after U.K. retail sales beat estimates. The Australian dollar led Group-of-10 gains as news China and the U.S. are resuming trade talks outweighed earlier short- selling spurred by a miss in the employment change; the euro rebounded to touch 1.1398 day high while the yen was the worst performer among G-10 currencies amid improved risk appetite. The Norwegian krone was little changed against the euro after the central bank confirmed what was already expected by markets, namely that a hike most likely will come in September. In other news, the Norwegian Key Policy Rate remained unchanged at 0.50% as expected. The Norges Bank said the outlook and balance of risks don't appear to have changed substantially since the June report and the outlook and balance of risks suggested that the key policy rate would most likely be raised in Sept. 2018. The upturn in the Norwegian economy is continuing broadly in line with expectations set out in June and Underlying inflation is below target, but driving forces indicate it will rise further out. President Trump stated tariffs will rescue the US steel industry, while he also stated he is considering interview with Special Counsel Mueller. In addition, there were separate reports that US President Trump's team is preparing to oppose a potential subpoena from Special Counsel Mueller. Elsewhere, metals rebounded after a hammering on Wednesday. Gold turned higher after touching a 19-month low. In Hong Kong, currency interventions continued after the currency fell to the weak end of its trading band. And though metals strengthened, oil prices were left flat after data showed a surprise weekly increase in U.S. crude stockpiles, compounding worries about a weaker global economic growth. Brent was at just over $70 a barrel and U.S. crude oil CLc1 last stood at $65.12 per barrel, having fallen to two-month lows of $64.42 per barrel, following Wednesday’s 3.2 percent fall. Expected data include jobless claims and housing starts. JD.com, Madison Square Garden, Applied Materials, and Nvidia are among companies reporting earnings. U.K. retail sales bounced back strongly in July amid warmer weather and extended discounts at stores. Sales gained 0.7 percent from June, compared with a median estimate of a 0.2 percent gain in a Bloomberg survey. In FX, EMs saw risk revival emanating from the region after reports that Turkey will get a much needed financial boost from Qatar ($15 bn) ahead of the Finance Minister’s investor call that could tempt others to follow suit. Meanwhile, plans are afoot for China and the US to engage in trade talks before the next scheduled exchange of import tariffs come into effect, and collectively this has given the Lira more recovery momentum (Usd/Try back down and more convincingly below 6.0000), alongside the Yuan (Usd/Cnh sub-6.9000 vs almost 6.9500 at one stage, and even though the PBoC pushed up the Usd/Cny mid-point again, to 6.8946 from 6.8856 on Wednesday) and other contagious EM currencies. DXY - The index has duly retraced further amidst the broad improvement in sentiment having stopped a fraction short of 97.000 yesterday and is currently pivoting around 96.500. AUD/NZD/EUR - The biggest beneficiaries from latest Chinese and Turkish-related news having borne the brunt in the G10 sphere when aversion was more prominent. Aud/Usd has bounced firmly from near 0.7200 lows above 0.7250, but looks capped ahead of a hefty 1 bn option expiry at 0.7300 and somewhat undermined by mixed Aussie jobs data overnight. The Kiwi has also pared recent losses to just south of 0.6550, though like its antipodean counterpart seems top heavy approaching the next big figure, as does the single currency at 1.1400 vs its circa 1.1300 base. However, the failure to break barriers at that level and trip stops below reportedly caught several shorts cold and forced a squeeze when Eur/Usd rebounded to and through 1.1350. NOK - No real reaction to the Norges Bank, as the accompanying statement merely confirmed previous guidance that flags a 1/4 point hike at the next policy meet on September 20. Eur/Nok relatively rangy between 9.5750-6130. In commodities, WTI and Brent are essentially flat, with WTI and Brent languishing around the USD 71.00/BBL & USD 65.00/BBL levels respectively. Gold is modestly benefitting from a USD that is set for its first fall in over a week, with the yellow metal up ~0.5% on the day, and testing the USD 1180/OZ level to the upside after breaking through its 50 DMA in the early morning. Base metals have recovered after yesterday’s sell-off, with all of lead (+4%), zinc (+3.4%) and copper (+1.9%) rising off the back of an improved risk tone owed to mending US-Sino trade relations. Looking ahead to today, we get the August Philadelphia Fed PMI along with July building permits and housing starts data. Walmart, Gap, and Nordstrom will also report earnings. The irony is that whilst Turkey has had a good 36 hours, the rest of global markets seem to be suffering from a delayed contagion reaction yesterday. Although there was risk off across the board, the highlight was Italy where 10 year yields climbed 13.7bp and edging above levels seen at the end of May (and to 4-year highs) when there was a constitutional crisis and 70 basis points higher than the recent lows of 2.47% back on July 18. Meanwhile, the spread to 10-year Bunds (now at +286 bps) is within 4 basis points of their May wides. Two-year Italian yields rose 12bps but remain 140 bps lower than the end-May highs, reflecting that this episode is not indicative of an immediate crisis of confidence but rather a re-rating of risk. Nevertheless, the moves were impressive given that yesterday was a public holiday in Italy. Perhaps that was part of the problems in that there was no local money to stand in the way of the international risk off. Risk is stabilising a bit overnight as it looks like high level trade talks between the US and China will be back on. This morning, Bloomberg noted that at the invitation of the US Department of Treasury, a Chinese delegation led by Vice Commerce Minister Wang will travel to Washington later this month for more talks. Following on, equities in Asia have recovered from session lows to trade modestly lower. The Hang Seng (-0.61%), Kospi (-1.03%), Nikkei (-0.21%) and Shanghai Comp. (-0.87%) are all down. Meanwhile futures on the S&P are pointing to a firmer start and the Yuan is stronger while the Lira is down c0.9%. Datawise, Japan’s July trade deficit was wider than expected at -231bn Yen (vs. -41bn Yen expected), in part as exports grew at a slower than expected rate of 3.9% yoy. After the bell in the US, Cisco also jumped +6% after guiding to higher than expected sales growth for the current quarter. Meanwhile on Turkey, the White House spokeswoman Ms Sanders noted that “the tariffs that are in place on steel (by the US) won’t be removed with the release of Pastor Brunson” while German Chancellor Merkel seems to be signalling some support as she noted “no one has an interest in the economic destabilisation of Turkey”. Now turning to equity volatility. After moving back towards the cyclical lows this time last week, we’ve spiked back up this week, especially in Europe. At 18.48 the V2X is all of a sudden at the highest level since the Italian led spike at the end of May and has now only been higher for two days since early April when it was still adjusting lower after the February vol spike. The VIX rose +1.3pt to 14.64 after an intra-day spike to 16.82 late morning US time. That spike in vol coincided with the lows of the day for the S&P 500 (-1.32%) but the market stabilised and rallied around the time of the Turkey/Qatar headlines and closed -0.76% lower. Losses were concentrated in energy and materials stocks, with those two sectors down 3.53% and 1.55%, as the commodity complex sold off broadly. Brent crude oil shed 2.35% to $70.76 per barrel, its lowest level in over 4 months. This is partially a result of the strong dollar, which, despite trading flat yesterday, remains within a few basis points of its highest level in over a year. Sentiment in the sector was not helped by US Department of Energy data at 3:30pm London time, which showed US crude oil inventories increased by 6.8 million barrels last week. That’s the biggest inventory build since March 2017, and was contrary to consensus expectations which had called for a 2.9 million barrel draw down. This increase in oil stockpiles is against the typical seasonal pattern where consumers increase their consumption amid summer driving trips, and the risk is it could signal softer demand moving forward. Other commodities also dropped yesterday, with LME copper futures falling 4.02% to their lowest level in over a year, while Zinc and Lead also tumbled -6.28% and -7.09% respectively. Sentiment was further depressed by poor earnings from Chinese internet giant Tencent, announced around 11:00am London time. Revenue and profit both fell short of expectations, with the latter actually declining yoy. Exuberance around the tech sector accordingly cooled somewhat, as investor concerns about valuations and growth deceleration resurfaced. The NASDAQ index lagged other major indices in the US, falling -1.23% and the NYFANG index of the biggest tech companies shed -1.62%. Separately, Macy’s posted solid earnings in the US, with sales and profits exceeding consensus, but the stock still traded -16.0% lower, impacted by investors’ concerns on higher than expected cost growth and discounting of goods (YTD share price +39.5%). Elsewhere Sears (-13.1%) and JC Penney (-8.7%) also dropped in sympathy. Developments in foreign exchange markets also weighed on equity markets yesterday. The Chinese yuan which had rallied a bit this morning broke above the closely-watched 6.90 level yesterday, and the weakening continued throughout the US trading session to touch an intraday level of over 6.95. This is the yuan’s weakest level versus the dollar since last January, though the Chinese currency has remained stable over the last week against the authorities’ tradeweighted basket. Asian currencies continued their recent outperformance versus other EM currencies thanks to this stability, but equity markets will probably remain attentive to the yuan’s continued slide against the dollar, as it has had a strong negative relationship with US equities this year (i.e. higher/weaker dollar-yuan exchange rate is associated with weaker stocks). So far, the weaker yuan has not reflected capital outflow pressures like in 2015-2016, but it could signal underlying weakness in the Chinese economy. Further weakness also raises the odds of further, market-unfriendly rhetoric and policies from the US administration. Having said all this, our China economists published a piece this week where they pointed to a loosening of financial conditions, which are expected to have some stimulative effect on growth by 1H 2019. Meanwhile they believe the Yuan will be under further depreciation pressure and expect USDCNY to reach 6.95 by end-2018 and 7.40 by end-2019. Back to yesterday, in fixed income Treasuries rallied along with German bunds. The 10-year Treasury closed at 2.86% and near the bottom of its recent range. The 2-year 10-year curve flattened back to 25 basis points, one basis points off of its recent low reached in mid-July. Bank stocks, which tend to perform better amid higher yields and a steeper curve, completely retraced yesterday’s gains, though their bonds held up well. The CDX IG and HY indexes widened 1.3 and 5.7 basis points, respectively, and on a single-name basis, energy firms again underperformed. Looking ahead to today, the euro area trade balance will print at 10:00am London time, followed by the August Philadelphia Fed PMI along with July building permits and housing starts data. Walmart, Gap, and Nordstrom will also report earnings.